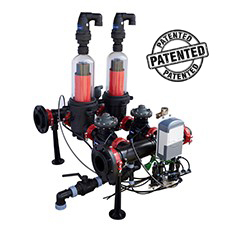 Filter includes specially designed Venturi devices to enhance flushing and save water. Min pressure required for flushing 1.5 bar. Backflush flowrate: 7.0 m3/h (at 1.5 bar). Filtration grade: 425 – 100 microns, (40 – 140 mesh). TAVLIT line of automatic disc filters model TVD combines high quality depth filtration with efficient flushing of the disc element. This unique automatic disc filter (patented), enables flushing at a very low pressure of 1.5 bar as compared to 3 bars normally required by such systems. The innovative technology of the filter uses venturi devices inserted at the spine´s inlets that introduce air during the flushing process to enhance it. the mixture of air and water enables more efficient flushing, uses smaller quantities of water for flushing and shortens the flushing time. It also enables proper flushing at a low pressure. The use of air also cushions the discs thereby reducing friction and prolonging the disc element life. The venturi devices insert air from the atmosphere and no external power or compressed air is required. The venturi devices are open only during flushing and do not operate during filtration.The filter element is composed of highly accurate grooved discs from excellent quality plastic materials. The grooved discs are compressed together to form the filtration element. The intersections between the grooves and the outer surface of the element offer large effective filtration surface with in depth area used to stop debris is especially effective in filtration of organic matter.